The claw is a scythe-shaped appendage that is attached to the end bone of the toe. The front feet have five toes and five claws per foot and the back feet have four toes and four claws per foot. 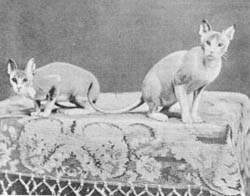 Some cats (known as polydactyls) have more than the normal number of toes and claws. A five-year-old moggy from Ontario, Canada is in the Guinness Book of Records for having the most toes. Jake has a total of 27 toes. Cats are able to extend and retract their claws using specialised muscles, tendons, and ligaments. Cat claws have several functions including; climbing, balance, digging, self-defence and holding onto prey. The claw is made up of keratin, a hard protein that makes up the sheath and in the centre of the claw is the quick which contains blood and nerves. 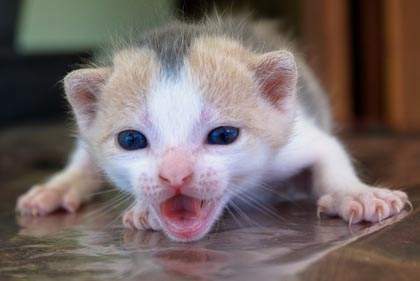 Some cats will bite and chew their claws while they are grooming. This is to remove the outer sheath from the claw. 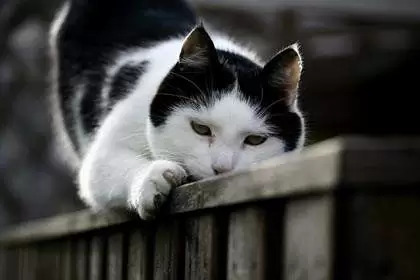 Nail biting can become a compulsive behaviour in cats, just as it does in humans, but generally, it is just a normal part of their grooming routine. It is always a good idea to run such behaviours past your veterinarian. A procedure carried out in the US and Canada, declawing is performed for non-medical reasons to prevent the cat scratching furniture or family members (both pet and human). Providing your cat with a cat tree/scratching post and working with the cat to encourage it to use that instead of your furniture. If space is a problem, you can buy small scratching posts that you hang over door handles that take up no room at all. For more information on training your cat to use a scratching post, read here. Trimming your cat’s claws regularly. You can’t stop scratching, it is perfectly normal behaviour. What you can do is train your cat to scratch on specifically designated objects so they will avoid ruining your furniture. For some owners declawing (which is prohibited in most countries) is their chosen method to prevent scratching. This is a rather painful operation which involves amputation of the cat’s claw up to the first joint. The majority of people strongly disagree with declawing of cats for a multitude of reasons. It is painful and unnecessary, it can also lead to other behavioural problems such as biting and inappropriate urination. Also, cats derive great pleasure from scratching and declawing deprives them of this pleasure. There are many alternative methods which are far kinder than declawing, which is really only performed for the owner’s convenience anyway. The plan is to make the current target unpleasant while providing your cat with a more attractive alternative such as a scratching post or cheaper scratching boards which can be hung from a door handle. There’s a huge variety on the market which will suit all tastes and budgets. Carpet or sisal cover most cat trees. If possible, temporarily cover the object your cat is scratching with some thick plastic or double-sided tape, which will act as a deterrent. Another you may want to consider are water sprays (use when your cat starts scratching the furniture), this may work but it may just stop your cat scratching when you are around. You can also try placing orange peel around the location. 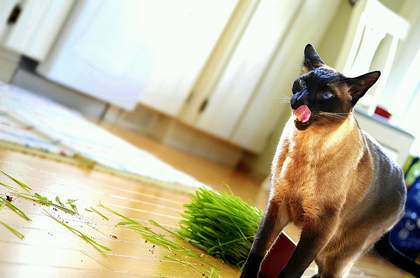 Many cats find the citrus smell extremely unpleasant. If you see your cat making a beeline for a favourite piece of furniture to scratch on, gently pick up the cat and move it over to the scratching post. If the cat uses it heap plenty of praise on your cat. Cats respond far better to positive behaviour than negative behaviour from their owners. Cutting your cat’s claws regularly will minimise damage caused to your furniture. For help on trimming your cat’s claws read here. Never physically punish a cat when you catch it scratching inappropriately. Physical punishment serves no purpose and more often than not has a negative effect on how your cat perceives you. A firm “no” and a spray with the water spray are more effective than smacking your cat. With time and patience, you will be able to re-train your cat to use a more appropriate object than your furniture. Good luck!!! 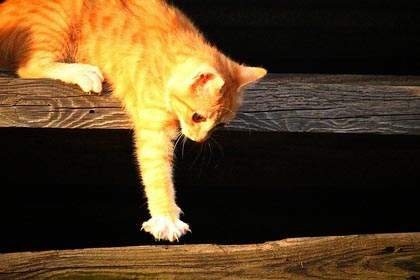 Cat claws continually grow, they wear down during outdoor activity such as climbing and scratching. Indoor cats may keep their claws short by using a cat tree/scratching post. However, older cats or cats without a scratching post can develop overgrown claws. 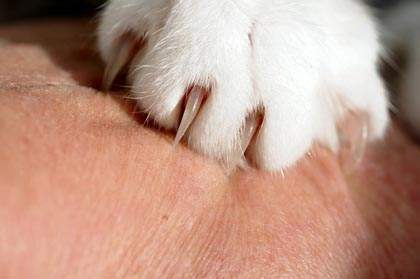 It is important to keep your cat’s claws trimmed to avoid overgrown claws which can result in injury, or in the case of my old and arthritic cat, the claws growing into the foot pad. Check your kitten’s claws and feet from an early age so that he becomes used to having his feet touched. For detailed instructions on how to trim your cat’s claws, read here. Previous articleCan I Catch A Cold From My Cat?